It was the final day of the Challenge, and a number of us were camped out in the Onion Valley parking lot. It was also a Sunday in August, so the Challenge crowd, which overwhelms lesser trailheads, was lost in the sea of cars from dayhikers, backpackers, and fishermen. I had never seen cars parked so far down the road at Onion Valley. 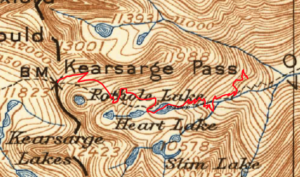 Other than the frustration of a trail reroute adding a bunch of horizontal switchbacks, Kearsarge is a pleasant approach, and it is a shame that I don’t get to use it more. I hiked along pleasantly with the group on the lower section, then cut ahead on the old trail to reach the pass a few minutes ahead of the rest. I stopped to eat and enjoy the view of Brewer and the Kearsarge Pinnacles while they caught up, then took the old trail down the other side. It has been deliberately destroyed, with rocks piled on its graceful curve, but it is still faster than the new one. I had not been to Glen Pass since 2011, a heavy snow year, and was surprised to find a dry stream and no snow on the south side. I was also a bit taken aback by the crowds. 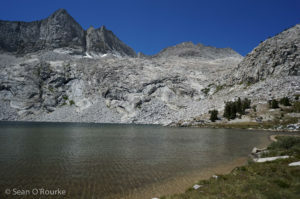 We had timed our arrival to coincide with the flood of people headed south from camp at Rae Lakes, either bound for Whitney on the JMT, or headed out to Kearsarge or Kings Canyon after a weekend backpack. 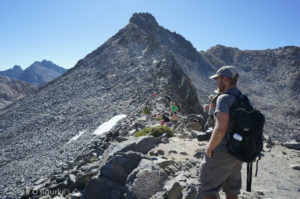 I chatted with two of the friendlier members of the dozen-strong crowd at the summit, then a few of us surprised them by taking off up the ridge toward “Glacier Spike,” which Bob had chosen as this year’s final peak. While the others traversed across loose-looking stuff north of the ridge, I found a pleasant, solid sidewalk up the crest, which took me nearly to the final step before the summit. I contoured left to meet the others, then climbed some class 3-4 terrain to return to the ridge just before the first of two summit regions separated by a steep gap. 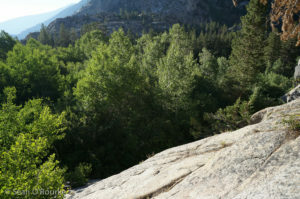 While the others followed the crest to the gap, then milled around in confusion, Bob and I snuck along a ledge on the left, then climbed through it to the right-hand side. Seeing a fourth class way to what might be the summit, I told the others I would check it out, then disappeared around a corner. As it turned out, I forgot to shout back that it worked, and they didn’t wait for such a shout. While I made my way over a black, slightly lower bump to the flat, white summit, Bob, Mason, and Gil dropped down and around to the south and found an easier way, joining me a few minutes later. 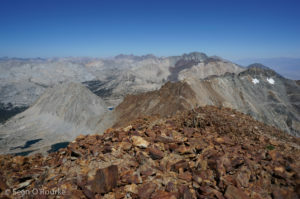 From the summit, it became clear that the peak is much easier from the south, and that it is possible to shortcut the trail by traversing to the saddle with Rixford, then dropping south toward Kearsarge Lakes. The four of us descended southeast, waving unhelpfully at a few others trapped just short of Glacier Spike’s summit. 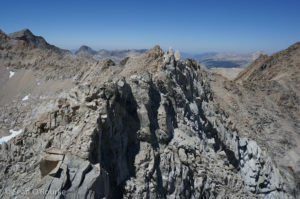 I left the others at the saddle, traversing on over Rixford, “Falcor,” and finally Gould to rejoin the trail at Kearsarge Pass. Rixford was just a big talus pile, though mostly solid when I stayed near the ridge or on a helpful goat-path. Looking back from its summit, I saw that the others had still not found their way to the summit in nearly an hour of trying. Most eventually made it, but at least one person was surprisingly defeated. After a bit of third class, things got much easier on the way to the popular Gould. 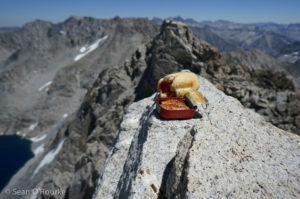 I boosted onto its summit block, then hid behind it to eat my last summit fish and savor the end of another Challenge before sand-skiing back to the trail. I was torn between desires to follow the old direct trail and not to be yelled at by self-righteous backpackers, so I followed a bit of both old and new. Apparently I was lucky, since some other finishers reported being approached by an overzealous ranger who asked for their permits (unnecessary for dayhikers) and sternly told them to stay on the trail (where they already were). I doubt she would have accepted my story about following the old trail for research purposes. Since I wanted to sleep up high, and had no need to head into town, I hung out with a changing crowd of Challengers into the early evening, then retreated to my car to read sometime just before when Scott finally returned from his final, insane 14.5-hour day. Having missed the last two years, the group had changed enough that I felt like a bit of a stranger, but it was a fun time overall, and a good way to stay focused and kill time while my hand continues to heal. I am less enamored of the Sierra than I was before spending more time up north, but they’re not a bad place to spend this part of 2016. 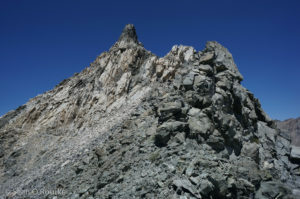 “Firebird Peak” is a bump on Norman Clyde Peak’s long northeast (“Firebird”) ridge. 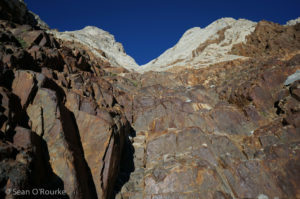 I had originally planned to find an alternative, but my only unclimbed alternate from the South Fork trailhead was “Big Kid,” a monstrous pile of sand, and I had little energy or time to plan after the previous 12-hour day. JD was planning to continue to Norman Clyde on his SPS list death-march, and I made noises about doing the same, despite having already climbed it twice before. There was a healthy crowd on the South Fork trail for the 6 AM start. 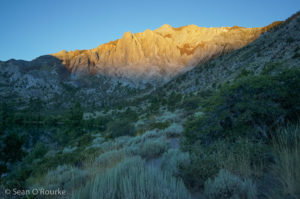 This is one of my favorite approaches for several reasons: the trail is livestock-free and built for humans; I used it for some memorable early Sierra climbs back when I was in school; and the sunrise on Middle Palisade’s and Norman Clyde’s east faces is always inspiring. As usual, I traded places with Bob on the way up the switchbacks: I would pull ahead while hiking, then he would pass me while I stopped to pee, put on sunscreen, or whatever. As I learned on my first Challenge, Bob almost never stops (or eats) on hikes. He also knows secret trails, as he demonstrated by emerging from the trees just ahead of us near Finger Lake after dropping behind below Brainerd. 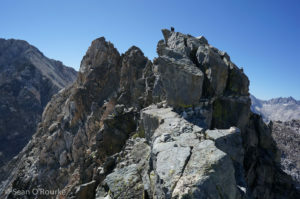 After some confusion about which point along the ridge was Firebird, we deviated from the standard Middle Palisade approach to climb a long, mostly-stable boulder-field toward the summit. I was tired, but still had an automatic sense of how fast I should go on this terrain when rested, so I ascended in bursts, periodically stopping to let the lactic acid drain from my legs. Scott, just behind me, mistakenly thought I was just stopping to take in the view. Reaching the summit, I found the register, which contained a few entries to the effect of “this thing has a register? Okay…,” then sat to wait for company. I eventually got out my summit fish, implicitly admitting that I would not be tagging any more peaks today. JD, who had had a nearly 20-hour ordeal the day before, arrived some time later, admitting defeat on Norman Clyde. He was dealing with a malfunctioning ankle that turned out to be much worse than he expected, and would send him home that evening. I probably spent about an hour on the summit before dropping down the dirt-slopes south to pick up the Middle Pal route and follow the familiar boulders and slabs back to Finger Lake and the trail. Talking with Robert near Grass Lake, I was surprised to meet Iris coming up the trail. Like JD, she was coming off a brutally long day, and had started around 10:45. In classic Iris style, she appeared to be cheerful, unhurried, and on the verge of disintegration, held together by tape and braces. There was no need to hurry, but Robert and I convinced each other to run from the switchbacks back to the trailhead, leaving me with plenty of time to socialize at the trailhead before descending into the brutal 100-degree heat of the Owens Valley. The next day’s low start meant there would be no convenient, cool trailhead camping. Taboose Pass is a once-a-year approach for me, and today was it. 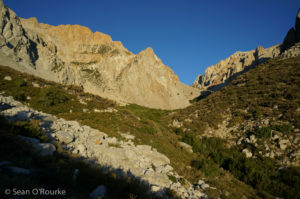 I don’t mind the 6,000 feet of gain, the various loose trail surfaces are tolerable on the way up, and the colorful cliffs to either side are beautiful in the usual morning light, as is the view of Arrow and Ruskin from the pass. Only in descending the pass, usually after a long and tiring day, does it reveal its fundamental hatefulness. Slightly tired and moving at a steady pace, it took me just under 3 hours to cover 7.5 miles and 6000 feet up. Going down the same took 1h45, despite taking the final sandy mile or so at a full run. In other words, the trail surface is so bad that it is impossible to average more than a fast walk. Indeed, some parts are slower going down than up, an unusual situation traveling cross-country and an evil miracle of bad trail-building. 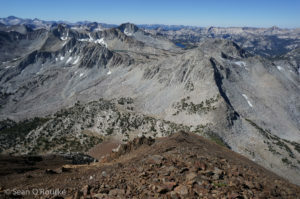 My ambitious plan for the day was to start by going around the day’s Challenge peak, unofficially-named “White Mountain,” to Pinchot Pass on the JMT before traversing back around to it via Wynne, Pinchot, and “Striped South.” This would net me two SPS peaks and a previous Challenge peak, putting me not quite within reach of catching Scott, but perhaps close enough to make him work for the Polka-dot Jersey. Of course, he needed no such motivation, and would put in a ridiculous final day no matter what I did. I did not know anything about the ridges around Striped South, and it turned out that the traverse to White would have been loose and scary, so I had to settle for three out of four. Robert had expressed interest in joining me on this adventure, but after falling behind below the pass, decided to just do White, so I had most of the day to myself. 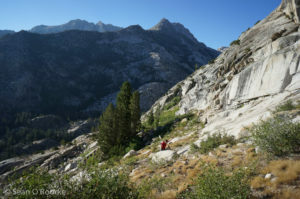 I passed a group of Boy Scouts on the way down to the JMT, then ran into the usual mid-August traffic along the popular trail on the way south to Pinchot Pass. I had gone this way a few years ago with Bob and Pat on the way to Ickes, so the route was familiar as far as Lake Marjorie. Leaving the trail at the pass, I found surprisingly decent class 2 rock leading to Wynne’s summit. 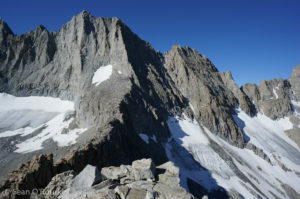 Though both Wynne and Pinchot seem like they should be class 2 rubble-piles from all directions, there is a surprising craggy feature on their connecting ridge. Taking a hint from Wynne’s register, I stayed near the ridge and found a bit of third class and generally decent rock. Past this feature, the climb to Pinchot is the expected class 2 talus-pile. I thought I was making good time, but found in Pinchot’s register that local runner Phil Kiddoo had done the same route nearly an hour faster. Sigh. 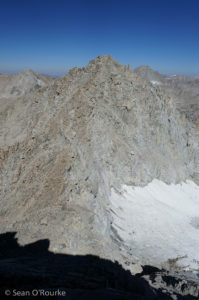 The choss-ridge to the north did not look appealing, serrated on top and loose on the sides. I stayed near the crest descending from Pinchot, finding a bit of third class getting around some drops, then followed a sheep-path on the west side around some pinnacles. It was not as bad as it looked, but still time-consuming. The rock quality suddenly improved as I reached the intersection with the ridge to White, just short of Striped South’s summit. 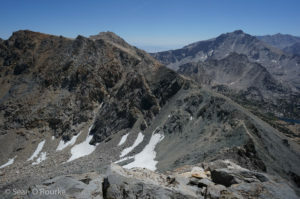 However, the first half of that ridge was crappy, red, and steep, looking just as bad up close as it had from a distance on the JMT. It might turn out to be loose 4th class, but I was not in the mood for that kind of physically and mentally exhausting climbing. On the good side, the ridge would likely foil Scott’s plan to traverse around to Striped from White. I decided to deal with White later, and continued to the nearby summit. The register, placed by Sierra Challengers in 2014, had seen all of two people since, one of them a sheep surveyor. I eyed neighboring Striped and White as I ate, contemplating my next move. The ridge to Striped was supposedly class 3, but looked intimidating, and I had already done the peak, so I decided to drop down to the lakes between White and Striped South, then maybe do the 1500-foot climb to White from there if I felt like it. I followed the ridge a short way north toward Striped, then began descending what I hoped was a “scree-able” chute. 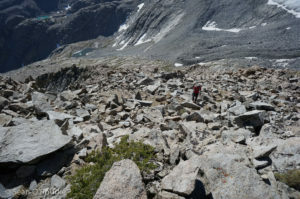 Unfortunately, what I found instead was loose talus mixed with outward-sloping slabs covered in ankle-biting scree. Partway down, I tapped a rock with my foot to see if it was stable, and it rolled a few feet, then broke into several pieces. Wonderful. After the tedious descent, I was in no mood to deal with White. I filled my water at the nearby lake, replacing the ice-ball that had formed when I added too much snow at a patch along the ridge, then cut cross-country to the trail just below Taboose. From there, it was just an hour and 45 minutes of frustration to the trailhead, where Jim was kindly waiting with cold beverages. As usual, Scott was still out doing something else. 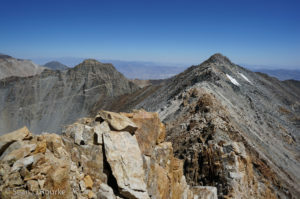 His original plan thwarted by the ridge, he had chosen to do Cardinal and a neighboring unnamed peak, adding another few thousand feet of talus-slog to his day. I’m getting too old to compete with that. A rabbit lost its tail? 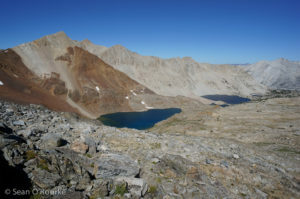 The Challenge Peak for the day was “Potluck Pass Peak,” a fun 4th class scramble reached by a scenic stroll through the Barrett Lakes. Since I had already done it as a bonus in 2012, and since there was more or less nothing I had yet to climb out of South Lake that was not insane (i.e. 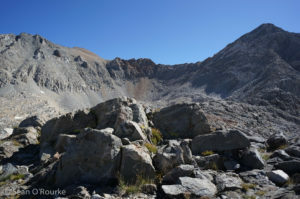 would involve crossing Le Conte Canyon), I headed to the Sabrina basin to tag some things on my to-do list. I am not always a fan of the area, with its long approaches and heavy packer use, but this was to be a fun outing, with interesting scrambling, some nice summits, and quiet time to myself. I found a spot to sleep in the small parking area near the North Lake turnoff, set my alarm for 5:00, and was soon asleep in the pleasantly cool air near 9000 feet. Waking to my alarm, I discovered that I had acquired a neighbor overnight, and he too had set his alarm for 5:00. We both flailed around preparing for awhile, presumably watching each other’s bobbing headlamps. I finished last, taking the time to heat my cup of sadness, drove to the outhouse at Sabrina, then back to the tiny day use parking area at the trailhead, and got started just before 6:00. I feel guilty listening to stuff while hiking with other people, so I had plenty of listening material queued up for the familiar miles to Blue Lake, then the unfamiliar ones past Baboon and Sunset Lakes. Above Sunset, I was presented with what used to be a small glacier, and an unappealing dirt-chute leading to the Powell-Thompson col. Fortunately, a slabby rib on the right got me most of the way across the moraine, and snow and bits of hidden ice eased passage to the base of the chute. I carefully kicked steps up the snow to one side, then switched to stepping nervously on rubble frozen into the dirt/ice substance, and finally worked my way along the right-hand wall to the col. The climb from here was probably just class 3-4, but with my current supply of hands, I had to backtrack a few times before finding a route that did not require a big right-hand mantle. An ascending traverse up the south side of the ridge eventually deposited me on the summit sand-plateau, with “Powell” close to my right, “Wesley” farther ahead to my left, and “John” obscured by the plateau/ridge in between. Clearly I had done things in the wrong order. I tagged Powell (the one on the SPS list), then marched across the sand to easily tag Wesley before getting back to serious work on the ridge to John. I descended a loose chute to the south a bit, then retreated to stay closer to the ridge. An experiment with a line on the north side worked, but with some sketchiness, so I returned to the crest, then worked my way along the top and ledges to the south, with occasional exposed moves between levels. Things got easier at the saddle, and I was soon on the last and highest JWP summit. When climbing this point several years ago after a big winter, Bob had used a snow/glacier route to the north, but I had no crampons or axe, and years of drought had pretty much hosed that option. 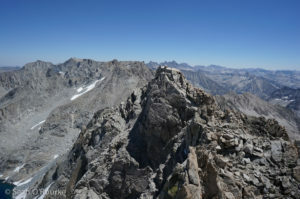 Besides, I needed to be south of Echo Col for the standard route on Clyde Spires, my next objective. This was probaboy the worst part of the day, a long, right-handed descent of garbage chutes and fins south of the ridge, leading finally to boulders below the pass. 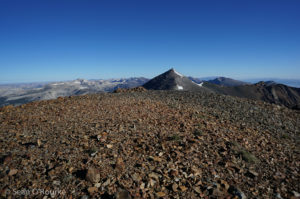 Coming off this experience, I found the Clyde Spires’ south ridge quite pleasant, a quick-for-tired-me hop up a stable boulder field nearly to the ridge. I checked out the east spire first, having to fetch a cheater block to overcome what would normally be an easy two-handed boost, and was soon on the big flat summit next to the register can. I sat down and had almost started eating my fish when I noticed that the west spire was both higher-looking and more spire-like. Secor confirmed that it was higher, so I packed up the register and made my way to the other summit; Norman deserved as much. The traverse was wander-y but not difficult until just below the summit block. Getting to the base seems to require either some chimneying from the south or something equally hard and slightly weirder from the west. I chose the chimneying, clanking and grinding as the register canister on my back gripped the rock. 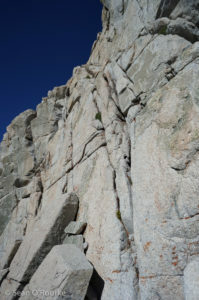 The summit block itself is maybe 10 feet high and very close to being one of the harder blocks in the Sierra. Fortunately, there is a sort of “mounting block” on its west side, and a perfect series of holds spiraling around north to the east side, leading to a flat top with just enough room for one person and his fish. I put the register in its rightful place, then had a late lunch while contemplating my return. I could retrace my steps down the south ridge and come back over Echo Col, but that seemed longer than traversing onward over “Crumbling Spire” to Wallace Col. Other than one less-sketchy-than-it-looked class 4-5 downclimb, the traverse worked well, and I was soon looking for the least-bad way down the east side of the col. I had hoped for easy scree-ing, but instead found mostly steep loose garbage that required a bit of care. Like Haeckel-Wallace Col to its north, this is not a “pass,” but a saddle where either side should be descended but never climbed. Filling my water at a nice lake where the two cols join, I noticed some people in the talus above. They waved when they noticed me, and I climbed out of my way within hailing distance to see what was going on. They turned out to be a group camped at Hungry Packer Lake, out for a “fun” wander through the talus, and unsure of their exact location. They seemed okay once I oriented them on their map, but if I had been thinking, I would have told them to try hiking up to the excellent Lake 12,345′ instead of suffering around below Wallace. 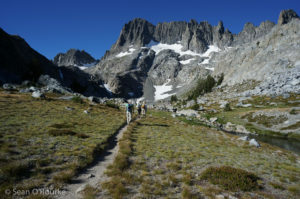 Sabrina’s length began to weigh on me as I joined the convergent trails near Moonlight Lake, but I had plenty of listening material, and enough stores of good-will from the day to last me to the trailhead. 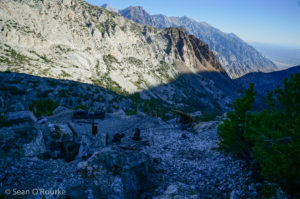 After a long-ish 12-hour day, I rinsed off in the creek, stopped briefly in Bishop for dinner and a chat with Bob, then drove back up to cooler climbs above Big Pine to prepare for the next day. 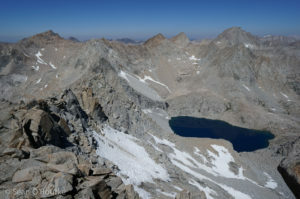 “Gable Lakes Peak” is a summit between Four Gables and Mount Tom on the rim of the Horton Lakes basin. This looked like an easy day on paper, with over 5000 feet of gain but not many miles, and much of it on trail. Had I been fully rested, this would have been the case. However, with advancing middle age comes slower recovery, and six days into the Challenge, my pathetically low maximum heart rate told me that I was performing well below my potential. While it was still short at around 6h45, it was enough effort that I had no energy for bonus peaks. We left at 6:00 from the same parking lot as the day before, but this time took the subtly-signed Gable Lakes trail. I believe I used this trail to do Four Gables in 2013, and it felt pleasantly familiar to pass the mine tram towers on a steep, narrow trail built for humans. The tram towers are squat, solid things over-engineered in the way things were before CAD/CAM. Bob and I once again traded places, while JD, fresh off a rest day, surged ahead, even jogging some of the flats. The three of us passed the mine ruins, consisting of a cabin, a couple pumps, a large motor, and various other debris worthy of Colorado. I dropped my camera while wandering around the ruin taking photos, and though it continued to work, the battery door broke. I found the pieces, put them all back in my camera bag, and stopped photographing for the day. The trail rapidly fades and disappears above the mine, and we skirted the lakes above through low grass and a mass of frogs and tadpoles. 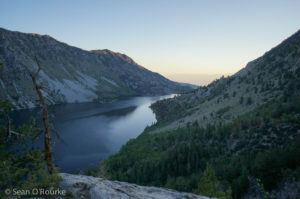 Before fishermen seeded them with rainbow trout, all northern Sierra lakes were apparently like this. 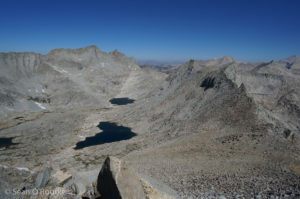 Above the last lake, we each took separate lines angling up Gable Lakes Peak’s northeast side. 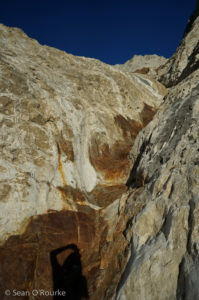 Our paths converged at a loose gap just below the summit, where I managed to start a decent rockslide down the chute. Fortunately no one was climbing down there, and we all safely reached the top. 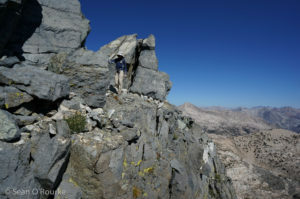 The register showed the occasional ascent by locals, and Eric’s traverse from earlier this year, but few people bother with the traverse from neighboring peaks. We hung around taking photos, then JD continued to Four Gables, while Bob, Michael, and I headed for home, passing Bob P. near the gap. Bob was once again not in a running mood, so I took off by myself down the trail, eager to be done in the midday heat, then had time to eat and rinse off in the creek before heading in to town for a shower. 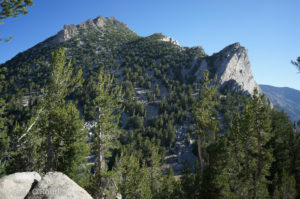 Mount Morrow is buried deep in the wilderness north of French Canyon, behind Merriam and Royce. 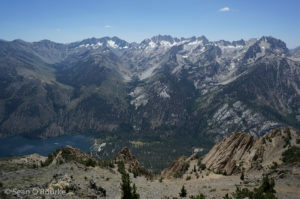 I had passed nearby in 2013 on a backpack from Onion Valley to Rock Creek, and done Merriam, Royce and Feather a few years earlier, but had never dayhiked over Pine Creek Pass. This was expected to be a long day, which meant a 5:00 start from the Pine Creek pack station. 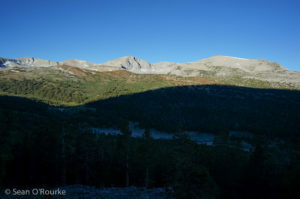 With its low start and packer-ravaged trail, this approach is best begun in the dark, completing the initial climb while the sun gradually illuminates Peppermint Peak to the northwest. 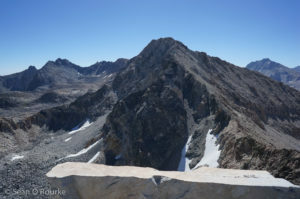 Following Bob’s suggested route, I stayed near the crest of Morrow’s broad east ridge, crossing a minor sub-summit and a short exposed section while weaving my way up class 2-3 slabs. 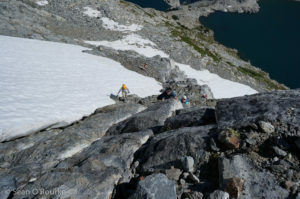 The final climb up the south face near the ridge is a mix of talus and sand, but not too loose. 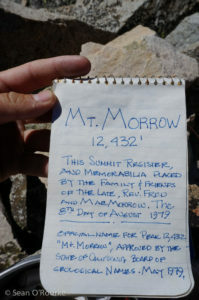 I looked around the east end of the summit a bit, then found the register in an old camping pot on the west end. It held some information about Pastor Morrow, and a copy of an official naming application (possibly not approved). I waited around for a half-hour hoping for some company, then headed north to tag a couple of bonus peaks when I started getting cold. The ridge looks tricky, but as I remembered from my last trip through the area, ledges and benches on its west side keep the traverse mostly efficient class 2. Reading through a nice old register on the first peak, I watched Bob and Eric making their way to Morrow’s summit, then continued to the next bump. This one proved more difficult than the first: a couple of rotten gaps in the ridge required some third class downclimbing, and the summit itself appeared to be class 3-4 by the easiest route (from the south). This one also had a register showing occasional traffic, though it was much newer. It was early enough that I was tempted to traverse on around on the ridge past La Salle Lake to Feather. 2009 me would have done so, but 2016 me, being wiser or at least more middle-aged, decided that that sounded like an epic in the making. Instead, I retreated south to the “pass” I had used in 2013, then descended past Merriam Lake and down the other trail to French Canyon. The rest was just a trail commute, 1100 feet up to the pass, then 3800 down to the trailhead. I passed poor Bob soothing his toes in the lake at the pass, then focused on my music as I jogged the pack trail home. I was feeling down on the Sierra after two days climbing lackluster peaks, and I needed something to cheer me up. 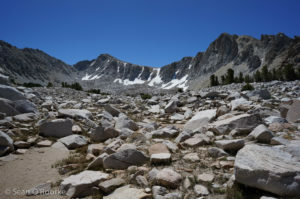 The Challenge peak of the day was Mount Bartholomew, an apparent talus-heap west of the Minarets, reached by much dusty trail through the woods from Devil’s Postpile. 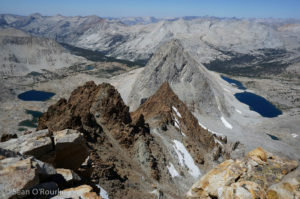 I hear it turned out to be reasonably fun, and to have good views, but a group including Renée and JD was going to the nearby Minarets, and I had unfinished business in that small group of jagged summits. We finally got started a bit after 6:30. I normally start the day walking, but they’re both runners (Chris is a pro), so we jogged the trench, catching JD and the rest between Shadow and Ediza Lakes. With horses not allowed past Ediza, the trail dramatically improves, and I enjoyed the alpine views as we hiked the sort-of trail past Iceberg to Cecile Lake, where we met James and his friend, whom I did not know. Together, the group of seven swarmed up the slabs and turf to the base of the Rock Route on the right side of Clyde’s east face. Sensing the potential for rockfall, and not having helmets, Chris and I peeled off to the neighboring Starr Route, which is slightly stiffer class 4, but with less loose rock and more fun. I was worried about climbing with only 1.5 hands (broken 4th metacarpal), but after a bit of adjustment I found that I could use my partial right hand for balance and figure out a sequence of left-handed moves. We topped out slightly ahead of the others, finding Loren waiting just below the ridge headwall. He had started off on-time and running fast, and is a strong climber, so I’m not sure why he waited. Anyways, I found a workable variant left of the (standard?) chockstone chimney, and popped over the ridge to a spectacular view of Michael Minaret, my original goal for the day. 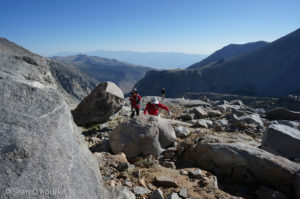 The rest of the group made its way down the crux step piecemeal, and eventually the eight of us assembled on Clyde’s summit. It was just after noon by the time the photos and hijinks were done. 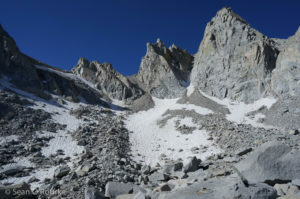 I remembered the traverse to Eichorn taking awhile with both hands some years ago, and Michael is farther still, so even if I could manage it in my current state (right hand uphill on the way out), it would be a long day. Lazy and pathetic, I retreated down the Rock Route, which was loose and a bit unnerving with so many people. 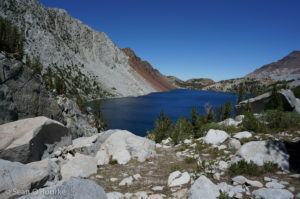 Things became more pleasant as we reached the slabs and trail, then started jogging near Iceberg Lake. Chris set a moderate pace that was probably frustrating for him, and we were making good time eating up the awful miles back to Agnew Meadows. Unfortunately, right as we reached the climb out of the valley toward the meadow, we came upon a large pack train. “You’ll have to stay behind us until the top of the hill,” we were sternly told. So we did, walking slowly up a trench full of sand and pulverized manure, dodging fresh piles of the same and a bonus lake of piss. Irritation fueled me enough to jog the rest of the way, thinking about negative externalities and the futility of trying to ban livestock from our National Parks. 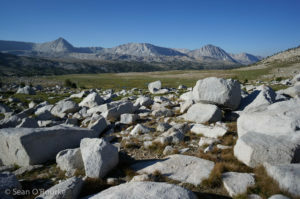 After dinner at the Mobile Mart (I brought my own), I drove up Tioga Pass for the next day’s peaks in Yosemite. Hoping to camp at my usual pullout on Saddlebag Lake Road, I was dismayed to find it already full of blatant campers; even the nearby trailhead I sometimes use was full. I finally settled for a lousy spot along a wide section of the road, and went to sleep with the occasional passing car’s lights flashing through my windows. I was up at 5:00, and at the Mono Pass trailhead by 5:40, but it was already full, and I ended up parking in an overflow pulloff a couple hundred yards up. Welcome to summer in the wilds of California, I guess. 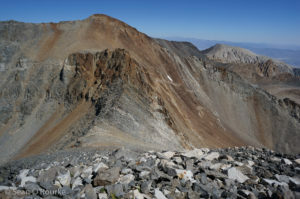 The day’s Challenge “peak” was a pair of bumps on Kuna Crest, a broad ridge leading from Mammoth to Kuna Peak. To leaven an unusually short day, I added Mount Gibbs, which is not connected to the others, but is nearby and on the SPS list. 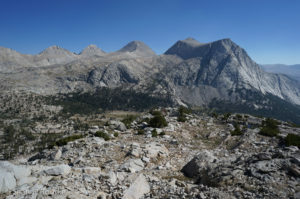 I stuck with the group, talking to Loren about various ambitious Sierra things past and future until he split off for Mammoth, then left the others when they took the trail toward Spillway Lake. I left the trail at an arbitrary point in the woods, and found myself near Gibbs’ broad southwest ridge. It turned out to be exactly the talus-pile it appeared to be, but was thankfully mostly stable, so after some climbing and a traverse along the south ridge, I reached the summit without too much pain. The fires to the southeast had left a layer of smoke, creating an interesting view of the hills in that direction. After signing the register, I retraced my steps, then took a more direct line toward Kuna Crest South. Getting down Gibbs sucked, but the rolling meadows over toward Spillway were pleasant. After a bit of a brush-maze getting around the lake, I headed straight up the talus ridge toward the summit. I passed Jim just below the summit, where I found a crowd of ten or so who had come straight to the peak. I paused only briefly before heading north along the ridge toward Mammoth. I had hoped (as had Bob) that it would be pleasant slabs, grass, or even compacted sand, but it was mostly a time-consuming boulder-hop. I stood on a few things that might be Kuna Crest North, then continued to Mammoth, still hoping to catch Bob. I missed him by about 15 minutes but, after dropping straight east down from the summit, finally enjoyed some pleasant, easy travel through meadows and open woods to the trail about a mile from the trailhead. I cooked my post-hike meal while being buffeted by constant passing cars, then carried my chair and pot back to the trailhead, which was at least slightly isolated from traffic. Ah, the majesty of Yosemite. After a rest day around Bridgeport, it was time to begin the 2016 Sierra Challenge. I have not done one of these since 2013, and the event has grown despite the peaks becoming even more secure. Coming off time by myself in the spectacular north Cascades and the Pacific volcanoes, it took some adjustment to start hiking the bland dregs of northern Yosemite with a crowd. On the other hand, the nights are cool and clothes dry here. I greeted some familiar faces in the predawn at Twin Lakes, then took off with the crowd at 6:00 through a sea of giant RVs. After a photo a bit up the trail we began to split up, with one guy running ahead, and the rest finding their pace up the pack trail. I got passed by everyone when I stopped to put on sunscreen, then passed them back one by one, catching up to the rest as they sat at the supposed junction with an old trail leading to a lake below Hunewill. I sized up the brush then, fortified by my recent Cascades time, boldly plunged ahead. I wove through various gaps in the dense aspens and what-not, eventually finding a gap along the left-hand cliff leading to bits of something a bit better than a game trail. I intermittently ignored and followed this trail toward the lake, laughing to myself at the crackling sound of thrashing humans below. Evidently only Chris and I managed to find this route, while the rest suffered mightily. 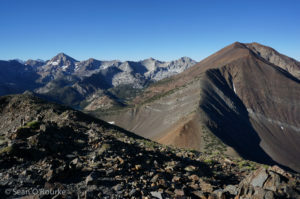 I slowly drew ahead of Chris on the long climb to the lake, then struggled up a steep sand chute to turn the corner to Hunewill’s southwest face and ridge. There I was faced with an endless slope of sand and brush. I followed sheep trails where I could, but still hit at least one brush dead-end, and it was slow going. Worse, it wasn’t the summit, but some nameless peak to its west, without enough prominence to give me points. I continued through the dip, failed to find a register, and sat down for a snack. The ridge ahead looked long and slow, and it was windy, so I found a sheltered spot to sit and wait for others, then follow the crowd. After around 20 minutes, Michael surprised me by popping straight up the south side of the summit. It turns out he had studied the map, and figured correctly that the direct sand slope would be miserable, but still faster than the roundabout way the rest had taken. We waited a bit more, and eventually Bob and a few others arrived. Bob had already done most of the peaks to the east, and wisely decided to return via the sand. Since the others decided to continue east, and I had nothing better to do in Bridgeport for the better part of a day, I did likewise. 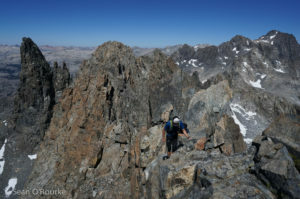 We descended some obnoxious class 2-3 to the saddle with Victoria, then traversed across some loose chutes north of the serrated ridge to reach its west face. The face was much more stable than it looked, and I made good time to the crest, passing Eric and Jonathan headed in the other direction. From there it was an easy traverse to Victoria’s summit, then on to Eagle, passing through a strange stripe of volcanic rock along the way. 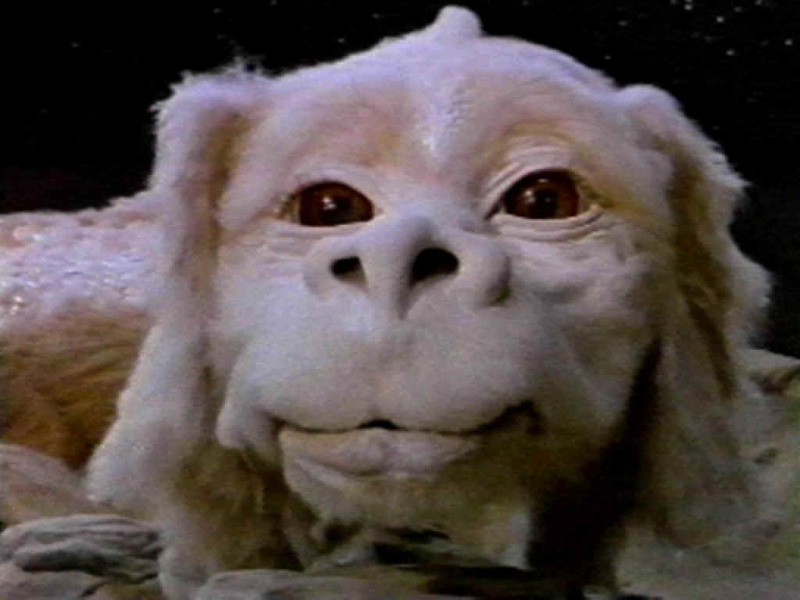 As I descended to the broad plain leading to Robinson, I saw a figure below, and knew he must be with the Challenge. It turned out to be Karl, who had started from a different trailhead, and intended to do Eagle and perhaps its neighbors. We talked for awhile, then I dodged trees and brush up to Robinson’s summit. From here it was about 3500 feet straight down to my car by the lake. I headed east a bit, then turned south on a sort of ridge leading in the right direction. Following game trails, I settled into a ravine that went from pleasant sand to increasingly dense and rigid brush. After a traverse right and a couple of desperate brush battles, I ended up on an open, brushy sand-slope with just enough game trails to make it miserable but efficient. I emerged from the wilds to find that Bob had been back about an hour, time enough to swim and start work on the Challenge spreadsheet. After finding the showers closed, my hiking clothes and I took a quick swim as well, after which I hung out eating and watching the others trickle in.